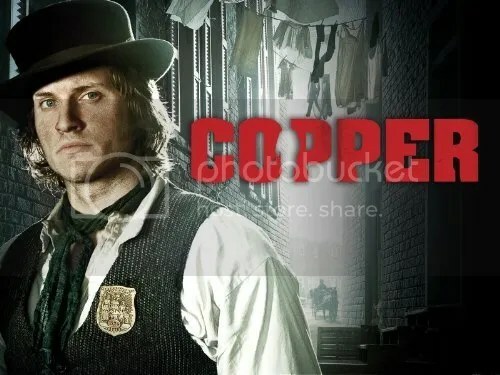 New York – October 18, 2012 – BBC AMERICA has renewed its first original scripted series, COPPER, for a second season, ahead of the season one finale this Sunday, October 21 at 10:00pm ET. The channel has re-commissioned the drama with an increased order of 13 episodes from Cineflix Studios. From executive producers Academy Award®-winner Barry Levinson, Emmy®-winner Tom Fontana, Academy Award®-nominee Will Rokos and Cineflix Studios President, Christina Wayne, COPPER follows Detective Kevin Corcoran (Tom Weston-Jones), a rugged Irish immigrant cop, as he seeks justice for the powerless in 1864 New York City. The series has been building to this Sunday’s explosive finale that will change lives and the city forever. With Confederate terrorists threatening to destroy the city as they know it, unexpected traitors will be revealed and once air-tight bonds will be broken beyond repair. Since its premiere in August, COPPER continues to be BBC AMERICA’s highest-rated drama ever, delivering over a million total viewers each week. On Sunday, August 19 at 10:00pm ET, the series premiere delivered 1.805 million total viewers and a cumulative 2.754 million total viewers in Live+7 Day. COPPER is a Cineflix (Copper) Inc. production in association with BBC AMERICA. COPPER is created by Tom Fontana and Will Rokos. Season one executive producers include Levinson, Fontana, Rokos, Wayne, Jim Finnerty, Sherri Rufh, Sam Berliner, Sally Catto and Katherine Buck.The production was shot in-studio and on location in Toronto, Canada. In addition to COPPER returning in 2013, BBC AMERICA’s second original scripted series Orphan Black, starring Tatiana Maslany, goes into production this month and will premiere in Spring 2013. BBC AMERICA delivers U.S. audiences high-quality, innovative and intelligent programming. Established in 1998, it has been the launch pad for talent embraced by American mainstream pop culture, including Ricky Gervais, Gordon Ramsay, Graham Norton, and successful programming formats including ground-breaking non-scripted television like Top Gear and top-rated science-fiction like Doctor Who. Owned by BBC Worldwide, the commercial arm of the BBC, BBC AMERICA has attracted both critical acclaim and major awards including an Emmy®, five Golden Globes® and ten Peabody Awards. The channel attracts one of cable’s most affluent and educated audiences and is available on digital cable and satellite TV in more than 79.5 million homes. It broadcasts in both standard and high-definition, with content available On Demand across all major digital platforms. Online, www.bbcamerica.com is the place to go to dig deeper into pop culture with a British twist. Find out more by visiting www.press.bbcamerica.com or follow us on www.twitter.com/bbcamerica. Cineflix Studios is an independent entertainment company operating worldwide with a mandate to offer channel-defining scripted programming to international broadcasters. Cineflix Studios partners with producers on premium projects, bringing our creative, co-financing, and distribution expertise. Launched two years ago, Cineflix Studios has built a strong foundation and a team known for their work on Emmy® Award-winning shows including CEO Peter Smith, President Christina Wayne, and President of Production Vlad Wolynetz. With a global focus, Cineflix Studios has offices in New York, London, Los Angeles, Toronto, and Montreal, and several projects in development in the US, Canada, and the UK. Cineflix Media Inc. is an international media company that brings together global broadcast and production partners, major talent, and key executives to create top quality original content produced and distributed for television and other platforms. Producing more than 400 hours per year of multi-genre television for international broadcasters, and with a rapidly expanding library of 3000 hours, Cineflix Media is a recognized leader with offices in Montreal, Toronto, London, New York, Los Angeles, and Dublin. This entry was posted in TV NEWS and tagged bbc america, copper, crime, drama, renewed, television, television series. Bookmark the permalink.